The Considerate Constructors Scheme has always championed the use of sustainable and local supplies – which is why it is backing the Grown in Britain initiative to promote British wood. Clearly signposted in the Scheme Monitors’ Checklist under the ‘Protect the Environment’ section, is a question asking how the site is making ‘a positive contribution’ to the natural environment by sourcing ‘local materials’. Now organisations can do just that by using wood products licensed under the Grown in Britain scheme which gives woodland owners, suppliers, retailers, and the construction industry, assurance of British-grown timber. A not-for-profit, government-backed and industry-led campaign, Grown in Britain (GiB) is bringing together people and businesses in a shared mission to increase sustainably-managed woodland in the UK to boost supplies of British wood. Procuring timber which is assured as Grown in Britain will create a more sustainable future for our own forests and woodlands. As with all materials sourced locally, this secures and creates jobs, supports local communities, helps the balance of payments and reduces carbon miles. The added benefit of local UK sourced wood is that it enhances woods and forests; managed forests are far better for wildlife, people, water supply and flood management and so on – the list goes on! GiB’s licensing scheme is a new and evolving journey, with land owners, organisations and companies urged to sign up woodland, sponsor forestry projects or get involved in tree planting or carbon balancing schemes. The Scheme is proud to support Grown in Britain for its work in promoting British-grown timber products to the construction industry. Not only will this help build a more sustainable and eco-friendly industry, but it will also breathe new life into the UK’s woodlands. The construction industry is a huge consumer of wood materials for everything from house frames to panels, floors and joinery, with 80 per cent of all UK wood being imported in 2013. A huge 27.7 million cubic metres of timber was imported to the UK in 2014, according to the latest Forestry Commission figures. Research published in October by Grown in Britain revealed that 92 per cent of large contractors would support an industry-wide commitment to use more home-grown timber. Many main contractors are already backing Grown in Britain including Willmott Dixon, Morgan Sindall, Lend Lease, Balfour Beatty, Kier, BAM and the STIHL Group, to name just a few. More than 60 per cent of construction companies surveyed by GiB said they would be keen to add clauses into contracts encouraging its use. We will never be self-sufficient in terms of timber supply; we are currently the 3rd largest importer of timber behind China and Japan. The Timber Trade Federation annually produces some great statistics for the sector; we are meeting about 40% of our softwood needs, but only 6% of our hardwood needs. The majority of panel products such as OSB, Chipboard and MDF are domestically-produced products but all plywood and hardboard is imported. In terms of softwood, the British climate produces fast-grown timber often classed as C16, this grade of timber is often used for non-structural applications, but its lower strength characteristics are increasingly being designed by engineers for structural uses such as upper floors or loadbearing walls. This often increases the spans by 5-10%, or slightly larger sections used. Overall we can supply many wood uses but not the entire manufacturing base which exists in the UK. GiB is the sole provenance standard which assures British timber and timber products, and has no competitors. It has a dedicated construction sector task group comprising of representatives from several UKCG (UK Contractors Group) members, with a collective turnover of £33bn. Charlie Law, managing director of environmental consultancy Sustainable Construction Solutions and co-chair of GiB’s construction sector task group, said more realistic timber grading recommendations would boost the British supplies. Speaking in Construction Manager, the magazine of the Chartered Institute of Building, he said that too many people are specifying C24-strength grade timber sourced from Europe, when C16 grade, most commonly found on the UK, would be sufficient. Buying timber which is Grown in Britain will provide another way for contractors to demonstrate they are sourcing locally and adding social value through the procurement of British timber. 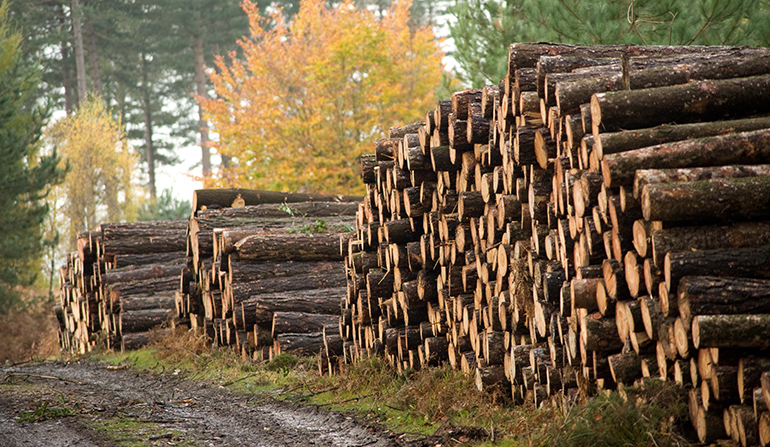 Grown in Britain’s licensing scheme fully recognises existing timber certification schemes such as FSC (Forest Stewardship Council) and PEFC (Programme for the Endorsement of Forest Certification), and also meets the government’s timber procurement policy and its UK Forestry Standard for managing woodlands. Easily recognisable, the Grown in Britain brand will be widely promoted on licence holders’ products, packaging and company stationary, featuring on anything from logs to furniture, panel products to sawn timber and charcoal to Christmas trees. Given that it typically takes 50 to 100 years to produce UK timber that can be used in construction, constant funding is needed to successfully manage woodland. By insisting on home-grown timber, contractors and their supply chains provide the economic incentive to attract new producers to invest, providing this sustainable resource for future generations. We all operate in a competitive market place and British timber is well placed to meet the needs of the construction industry. The recent slide of the Euro against the pound will have an impact by tightening margins, however, Grown in Britain licence holder BSW timber report that the GiB brand has such value with clients that it has prevented switching to imports when exchange rates fluctuate which is a fantastic endorsement of the value added nature of Grown in Britain.